This weekend, I went to visit my husband’s family. While I was there, I took a number of my Photo Hunt shots to share with you on Wednesday, September 1 (as well as some of the shots I shared with you yesterday for Scavenger Hunt Sunday). But, before we left…I was sure to take a few other photos…three of which I’m sharing today and one that I think I’ll save for Friday…and yet another one on Sunday for next week’s Scavenger Hunt. 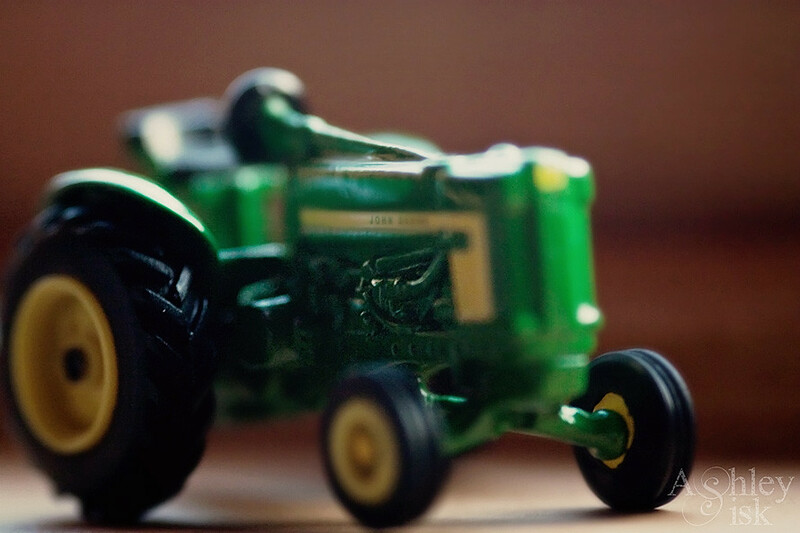 This first shot is a miniature John Deere tractor that I found in my brother-in-law’s old bedroom. For whatever reason, I really enjoy macros of miniature items – I think I also like that I don’t photograph them in complete focus so they have this blurry effect. Yesterday, we got back on the road to head home. I keep my camera in the front seat so when the mood strikes, I can pick it up and snap away. 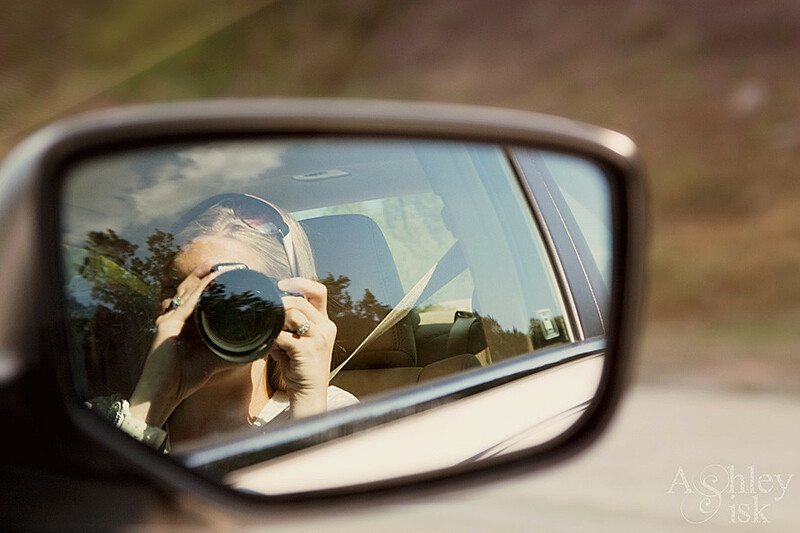 I recalled that this week’s Paper Mama Challenge is self portrait (and I knew I wouldn’t have another chance to take a selfie), so I thought, “Mirror Photo!” My only regret is that I didn’t capture more of the beautiful landscape as we were driving in this shot. 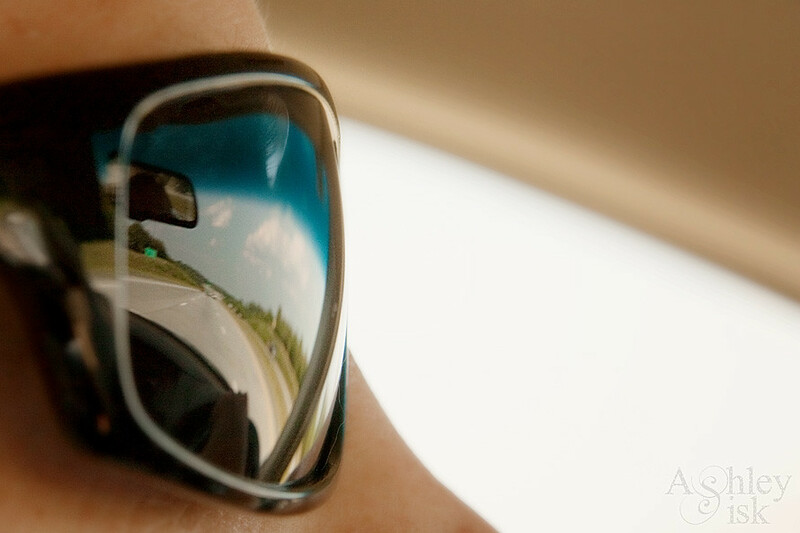 Finally, what I lacked in my self-portrait, I made up for in my husband’s sunglasses. Our drive back from his parents is always so beautiful. I just wanted to share…for the sake of sharing. While I’m here…head’s up: I am traveling back to California tomorrow morning to meet with one of my clients. I will be taking the red eye back on Wednesday night to arrive home on Thursday morning. I tell you this because although I have a few things posting in the next few days (In a Yellow House photo challenge and the August 2010 Photo Hunt Unveiled), I will be away from my computer. Please be patient with me as I return emails, visit blogs, etc. Oh…one more thing…it appears as if I’ve hit over 500 followers (ack – I prefer the word FRIENDS). I wish I had some sort of giveaway ready since it was so much fun the last time, but the reality is that I’ve got nothing. If you’d like to sponsor a giveaway, please shoot me an email and I’ll coordinate something in the very near future. Have a great week everyone!